Which Country Has The Healthiest Diet? Find Out! Which Country Has The World’s Best Diet (And How Can We Learn From It)? In our modern world, nothing quite highlights the privileges we posses like the availability of food and the overconsumption present in our society. Those who have access to grocery stores rarely take the time to reflect on just how fortunate they are to have such an abundance of food at their disposal. This creates a dangerous complex and the byproducts are issues like morbid obesity, diabetes, and heart disease. The overabundance of food in restaurants and at stores raises a question: are these first-world conveniences hurting us more than they are helping us? Sure, we all need to eat everyday, but is the accessibility factor actually responsible for unhealthy outcomes in countries like America? 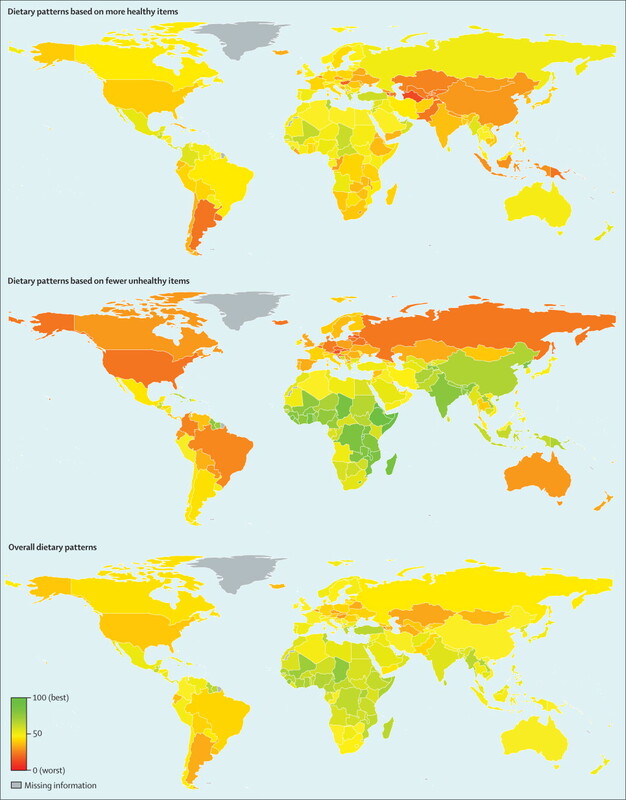 The Lancet Global Health recently posted a journal based on a decade-long study of the diets of almost 4.5 billion adults across 187 countries. Their findings are both important and surprising. Those who live in high-income countries often do not realize that the vast number of food-related conveniences at their disposal can actually be a dangerous thing. According to this research, which contains data that spans two decades, people from countries in Africa such as Chad, Mali, and Cameroon have the healthiest overall diets. Other low-income countries such as India and China have consistently healthy diets as well. The study found that although the worldwide consumption of healthy foods has increased during the last two decades, so has the the intake of unhealthy foods such as processed meals and excessively sweet drinks. In countries like America, people have grown accustomed to getting exactly what they want, exactly when they want it. Thus, supply and demand creates an avenue for overconsumption and excessive waste. These concepts are ideologies of the psychology of grocery stores. The findings of this study propose that nations have been increasing their consumption of unhealthy foods at different rates. A large number of high-income nations are showing decreased rates of consuming unhealthy foods, but they are still far behind most African countries in terms of truly healthy eating. These countries have had healthy diets for generations and practice much more restraint when it comes to leading balanced lifestyles. So how does America truly stack up? America is easily one of the most unhealthy places in world, ranking near the top of the “unhealthy diets” list. America is experiencing an ongoing health crisis. One in four deaths in the United States is related to heart disease, which is commonly a byproduct of poor diet, and 735,000 Americans have heart attacks each year. Aside from cardiac issues, obesity is a massive problem in the United States as well. A little more than one third of children and adolescents are overweight or obese. Rates of obesity have more than doubled in children and quadrupled in adolescents in just the past 30 years. Childhood obesity is certainly an issue we must face. Beyond poor diet choices, millions of Americans are dependent on alcohol and 81.3 million Americans smoke tobacco products or use smokeless tobacco regularly. Think about how overconsumption may be a part of your life. Focusing more on healthy foods at proper portions instead of constantly indulging is a step in the right direction. I’m by no means implying that you should give up all of your favorite foods and snacks cold turkey. Focus on a lifestyle that is balanced. A great way to lead a healthier lifestyle is by introducing new healthier meals into your diet. The following African-inspired dishes are an excellent jumpstart to a healthier mindset. (All recipes courtesy of Eating Well). 2. Place peppers upside-down in a microwave-safe round casserole dish just large enough to fit them. Add 1/2 inch water to the dish and cover with a lid or inverted dinner plate. Microwave on High until the peppers are tender but still hold their shape, 3 to 6 minutes. Drain the water and turn the peppers right-side up. 3. Meanwhile, cook beef and garlic in a large nonstick skillet over medium-high heat, breaking up the beef with a wooden spoon, until no longer pink, 4 to 6 minutes. Stir in currants, cumin and cinnamon and cook for 1 minute. Stir in the rice and cook for 30 seconds more. Remove from the heat and stir in 1/2 cup vegetable juice, cup mint, orange zest, salt and pepper. 4. Spoon the beef mixture into the peppers. Pour the remaining 2 cups vegetable juice into the dish and cover. Microwave on High until the juice and filling are hot, 2 to 3 minutes. Serve the peppers with the sauce and garnish with mint, if desired. 2. Heat oil in an ovenproof casserole or Dutch oven over medium heat. Add onions; cook, stirring often, until softened, about 4 minutes. Add garlic and ginger; cook for 1 minute, stirring constantly. 3. Add chicken; cook, stirring often, for 8 minutes. Stir in coriander, cumin, cinnamon, salt, pepper and cloves; cook until aromatic, about 20 seconds. Stir in broth, kumquats, chickpeas and honey. Bring to a simmer. 4. Cover the pan and transfer to the oven. Bake, stirring occasionally, until the chicken is cooked through and the broth is bubbling and somewhat reduced, about 1 hour. 1. Stir together yogurt, parsley, cilantro, lemon juice, oil, garlic, paprika, cumin, salt and pepper in a small bowl. Reserve 1/4 cup for sauce; cover and refrigerate. Place salmon fillets in a large sealable plastic bag. Pour in the remaining herb mixture, seal the bag and turn to coat. Refrigerate for 20 to 30 minutes, turning the bag over once. 3. Oil the grill rack. Remove the salmon from the marinade, blotting any excess. Grill the salmon until browned and opaque in the center, 4 to 6 minutes per side. To serve, top each piece with a dollop of the reserved sauce and garnish with lemon wedges.